One of my favorite parts of this job is seeing what people do with 3D printing technology, not for money or as a job, but rather just because they can. Over the years I’ve seen all sorts of amazing 3D printed artwork, strange or humorous statues, and clever solutions to unique problems that could only be solved with a 3D printer. But my absolute favorite is when people use 3D printed parts and use them to create their own unique robots. Sergey Grishchenko is a hardware and software developer from Ural, Russia and he is pretty fond of robots himself. He also says that he’s a pretty big fan of things made by NASA and Roscosmos (the Russian counterpart to NASA), just like any engineer. 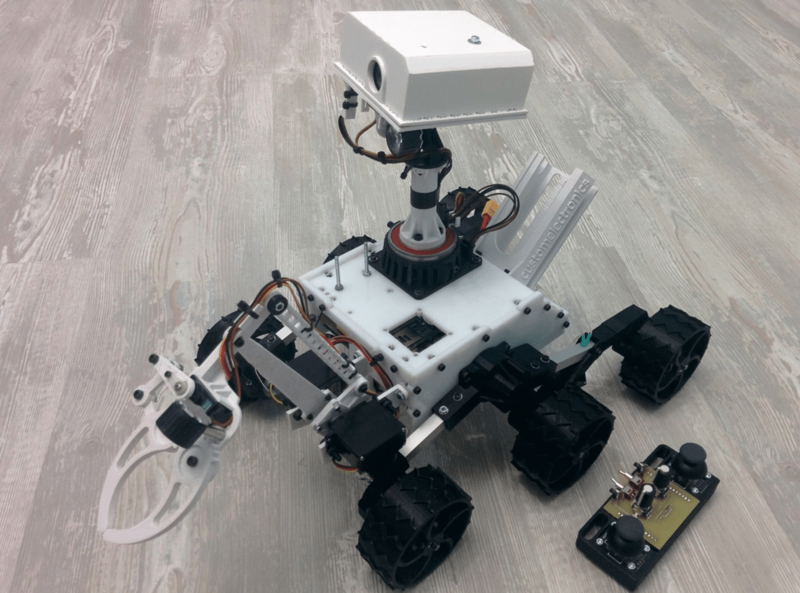 That love of space is what prompted him to use his robotics knowledge and 3D printer to build his own small, Earthbound version of the Curiosity Rover. Grishchenko’s baby version of Curiosity may not be able to survive on the lifeless surface of another planet, but it is still equipped with everything that it needs to explore the lifeless surface of your living room floor. Lil’ Curiosity is equipped with six wheels just like its big brother that let it climb over obstacles and uneven surfaces. It has an articulated claw arm that can pick up your socks or snap closed menacingly while you chase after your dog. It can transmit video so you can see what it sees and it even has spotlights to illuminate the dark corners of your home while in search of new life forms. “It can pour drinks or be a telepresence robot. It’s all about imagination and programming skills. In fact, I developed it because I can. It does not have a specific purpose today. Just a fun toy. My wife says that it looks like Wall-E,” Grishchenko told us via email. The rover is connected to a PC using Bluetooth and operated by a remote that connects to the PC via USB. The remote allows all six wheels to be moved independently, so Curiosity has a full range of movements and motion. It has a range as far as the Bluetooth connection will allow and because the head gimbal is also completely motorized you can move the camera in virtually any direction that you need and watch back on your computer screen. Almost all of the rover is constructed from 3D printed parts, including the wheels, the claw arm, the wheel suspension, the rover’s body, and even the box that contains the remote electronics. The main electronic part that Grishchenko used was the LinkIt One dev board that connects the rover to the computer. It also lets him run the DC motors that run his rover as well as all of the drivers involved. 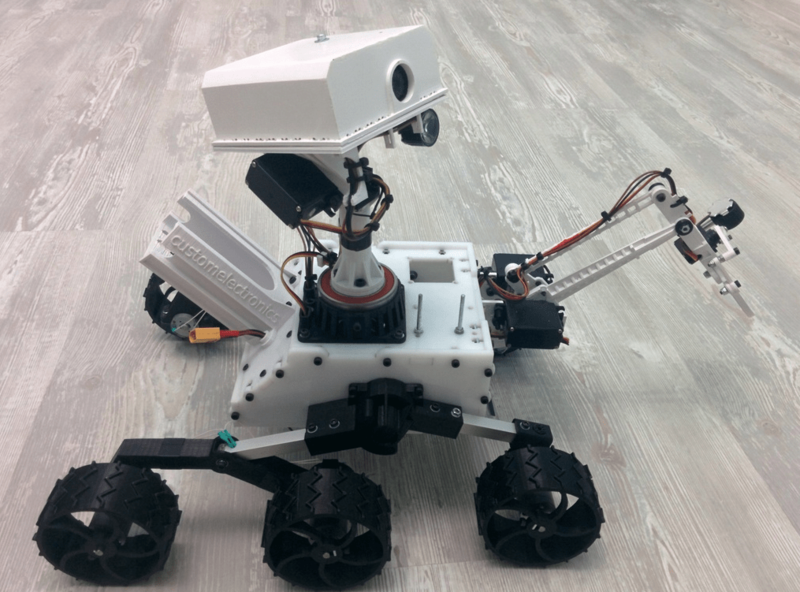 While Grishchenko has yet to release a complete tutorial on building your own rover, he has put all of the 3D printable parts up on Thingiverse so experienced makers can try their hands at building their own. What do you think about the at-home, 3D printable version of Curiosity? Let us know over on our Working 3D Printable Curiosity Model forum thread at 3DPB.com. A newly-established Russian company, Zdravprint, or Healthprint, has come up with its own ideas on how to replace an individual lightweight cast. The venture fund Maxfield Capital, a firm that invests in global seed and early stage technology companies, has already allocated $100,000 in investments for the development of water friendly 3D- printed cast alternatives, which heal a lot faster and help to avoid the annoying itchiness while healing the fractured bones. 3D Printed Cast, developed by Zdravprint, a brainchild of the Russians Fyodor Aptekarev and Aleksandr Charkassov, has even more advantages compared to conventional fracture plasters. It allows air to be supplied to the injured parts of the body, hence the skin under the plaster does not become dry and scaly. It causes a lot less, if any, macerations, ulcerations, infections, rashes, itching, burns, and allergic contact dermatitis. It is a lot lighter and does not restrict movement as much. The process is as following: First a patient has the injured limb scanned in three dimensions. Then, a computer makes a model of the splint or cast using special plastic in a 3D printer. The plastic cast can be made in any color, and once printed all that needs to be done is for it to be heated and smoothed into shape. A plaster cast, however, is still needed in the first stages of repairing a break, as it enables doctors to control and adjust the initial bone union. This lasts for about a week until the swelling subsides. It is only after this that the 3D-printed version can take its turn. Production of the new type of cast takes about 12 hours in terms of the actual printing, and the subsequent fitting can be completed in less than an hour. Aptekarev claims he got the inspiration for the idea from a 3D printed dress designed by Francis Bitonti. As a skateboarder, he has suffered a number of broken bones, and suffered from an uncomfortable heavy plaster cast, which invariably itched. Thus he came up with the idea of introducing a custom-made cast using a 3D printer to help people overcome their medical problems. Aptekarev predicts that within seven years, his 3D printed casts will have taken over from plaster completely.